Fluke is voluntarily recalling certain 707Ex Intrinsically Safe mA Calibrators shipped between March 1, 2016 and November 31, 2016. The affected Fluke part numbers and serial numbers are listed in the table below. Any serial number within the range above but additionally marked inside the battery door with the Service Alert number SA2909 is NOT affected by this recall notice. 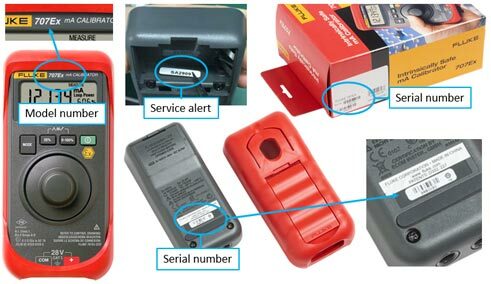 The images below show where to find the model, serial number, and service alert labels of the products. * If the serial number is missing or illegible, your product is part of the recall. Follow the recall instructions below. If you own one of these mA Calibrators, please stop using it and send it back to Fluke. If someone else within your organization is the primary user of a Fluke 707Ex Intrinsically Safe mA Calibrator or is responsible for responding to recall notices, please pass this notice along to the appropriate people. The Product has been designed for use in Ex-Hazardous Areas. These are areas where potentially flammable or explosive vapors may occur. These areas are referred to as hazardous (classified) locations in the United States, as Hazardous Locations in Canada, as Potentially Explosive Atmospheres in Europe and as Explosive Gas Atmospheres by most of the rest of the world. Herein referred to as “hazardous location”. The encapsulants that enclose certain critical printed circuit board components inside the calibrator may be insufficiently applied. These encapsulants constitute protective measures necessary for the product’s certification for use in a potentially explosive environment. There are two different encapsulants applied during the manufacture of this product, and Fluke has discovered issues with both applications. The first encapsulant, a conformal coating, limits the exposure of components to external environmental sources. The second encapsulant, a potting compound, excludes explosive gas from entering the relay body in the event of a leaking relay seal. The relay constitutes a potential ignition source if the second encapsulant is not properly applied. Insufficient application of these encapsulants could result in an exposed ignition source in a hazardous location. Immediately stop using your affected Fluke 707Ex Intrinsically Safe mA Calibrator.